Ukulele is an instrument for everyone. No matter how young or old you are, and even if your definition of making music is just turning on the radio, you learn can learn how to play. To kick off my adventure at Yours, I’m going to show you how you can learn to play the ukulele. As a teacher and lifelong ukulele player, I’ve seen students from 6 years old to 92 years old learn how to play ukulele. If they can do it, you can do it too! In this lesson, learn how to tune your ukulele with the most essential steps and get ready to play. In the following lessons, I will teach you the steps required to play your first song. Surprisingly the fastest and quickest way to sound better as a new ukulele player is to simply tune your ukulele. This is an important but often overlooked step by beginners because they think since they’ve tuned their ukulele once they’re all ready to go. As you play, strings naturally stretch and change from their original intended pitch. Changes in temperature or humidity affect the tuning. Different ukuleles or strings hold tuning better than others depending on the quality. This means things might start to sound “off” as you play chords and strum merrily along. This is normal and expected, so don't sweat it. This just means small tuning adjustments are required every so often. Needless to say an in-tune ukulele will always be more inspiring to play and your listeners will thank you for it! For the best sound, check your ukulele tuning every 15 minutes. Don’t worry because after this lesson you’ll be a pro at tuning and making small adjustments on the fly to keep your ukulele in tune. Most ukuleles are tuned to standard reentrant tuning where the strings from top to bottom (as if you’re holding the ukulele) are tuned to g-C-E-A. To tune in this manner, all that is required is a soprano, concert or tenor-sized ukulele and a set of ukulele strings designed for standard tuning (read more about different ukulele sizes here). Notice the top and bottom strings are tuned higher than the middle two strings as shown on the music staff. It’s said the ukulele is tuned to reentrant tuning because of the high g-string (as indicated by a lowercase “g”). Reentrant tuning is what gives the ukulele its charming, bright and happy sound. See the notes of ukulele tuning on the piano keys as well. Now that you know the notes it’s time to learn how to tune to those notes. The easiest way to tune your ukulele by far is with a chromatic tuner. A chromatic tuner is a small device that clips on to your ukulele headstock and detects the pitch when you pluck a string. Additionally, you can download a “chromatic tuner” app for your smartphone and the app will listen to the pitch as you pluck a string. 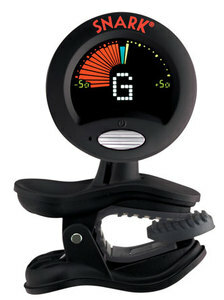 Upon detecting the pitch, a chromatic tuner lets you know if you need to tune up or down in pitch. For example, if you pluck the top g-string and the tuner reads an “F” note, then, this indicates you are below the pitch (since F becomes before G in the alphabet) and you need to turn the tuning peg to move the string up in pitch. Likewise, if you pluck the C-string and the tuner reads a “D” note, then, this indicates you are above the pitch (since D comes after C in the alphabet) and you need to turn the tuning peg to move the string down in pitch. For a full 5-minute video lesson showing you how to use a chromatic tuner, check out my more in-depth lesson on how to play ukulele. You may have come across musicians who can tune by ear where they listen to a pitch of a string and match it with the intended pitch. For beginners, I don't recommend this method, but it's worth mentioning. This a more advanced method of tuning and can be handy if you don’t have a chromatic tuner nearby. However this method of tuning by ear will never be as accurate as using a chromatic tuner. That is unless you have perfect pitch, which let’s be honest, most of us don’t. Seriously, just use a chromatic tuner or download a "chromatic tuner" app to your smartphone. However, if you wish to learn and get audio clips showing you how an in-tune ukulele should sound when tuning by ear, then, read more about how to tune your ukulele by ear here. For this lesson, you should know about two other popular alternative ukulele tunings: baritone tuning and low G tuning. Baritone tuning is tuned just like the bottom four strings of a guitar. If you have a baritone ukulele, you’re most likely tuned to baritone tuning, which is from the top to bottom strings D-G-B-E. This tuning produces a deeper, warmer sound because the strings are tuned lower in pitch relative to a standard-tuned ukulele. Because a baritone ukulele is tuned like the bottom four strings of a guitar, the chord positions are different for a baritone ukulele than a standard-tuned ukulele. To discover the chord positions for a baritone-tuned ukulele, simply look up the guitar chord diagrams, which will show you a six-string guitar chord position. To play the chord on your baritone ukulele, learn the position of the bottom four strings ignoring the top two strings of the guitar chord diagram. If you have a baritone but would like to play standard, regular ol’ ukulele chords, some baritone players decide to purchase a set of tenor ukulele strings in standard tuning to follow along with my lessons. Low G tuning is just like standard ukulele tuning except the top g-string is tuned down an octave to a low G-string. This produces a linear order of pitch from the top string to the bottom string (lowest to highest in pitch) with gives you a sweet and charming sound with additional warmth in the lower register. 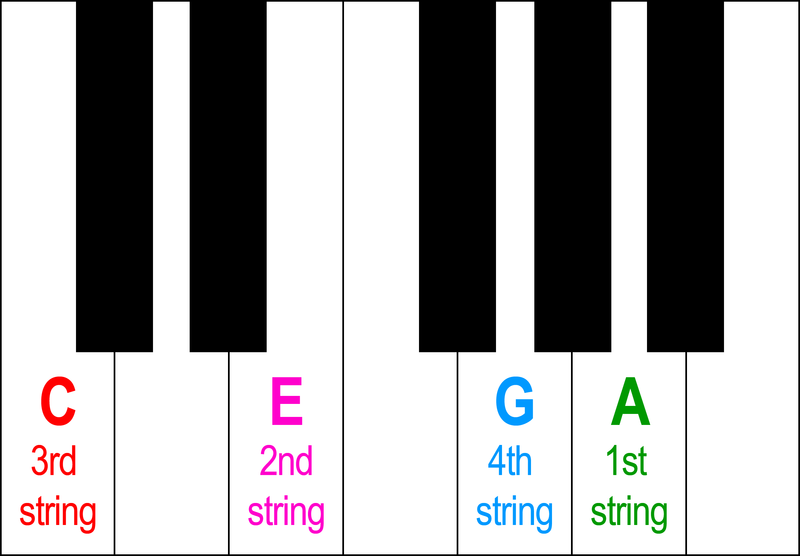 Note: A special low G-string is required to tune to low G. Do not try to tune your high g-string down the octave. It won't work. Unlike baritone tuning, low G tuning uses the same chord positions as in standard tuning, meaning you can easily play along with a standard-tuned ukulele in low G tuning. Low G tuning is particularly desirable if you play chord melody on ukulele since the tuning adds five additional notes to the lower register. In this lesson, you’ve looked at the most essential steps for tuning your ukulele. There are a lot of different ukulele tunings but to get started you just need to get a chromatic tuner and tune up to standard ukulele tuning. Your objective for this lesson is tune up your ukulele in standard tuning. In the following lessons, we’ll look at how to hold the ukulele, how to play chords, how to strum and how to play your first song. Learning to play a new instrument like the ukulele can be overwhelming at first but it doesn’t need to be with the right steps and focus. I can not promise, but I do my best to tip you for each lesson. Thanks, mishapelt! I appreciate the feedback. Still figuring things out but very excited to be here! I will adjust the comment price for the next post per your recommendation.